Clamperl in game: 2,399 Who? Important notice! 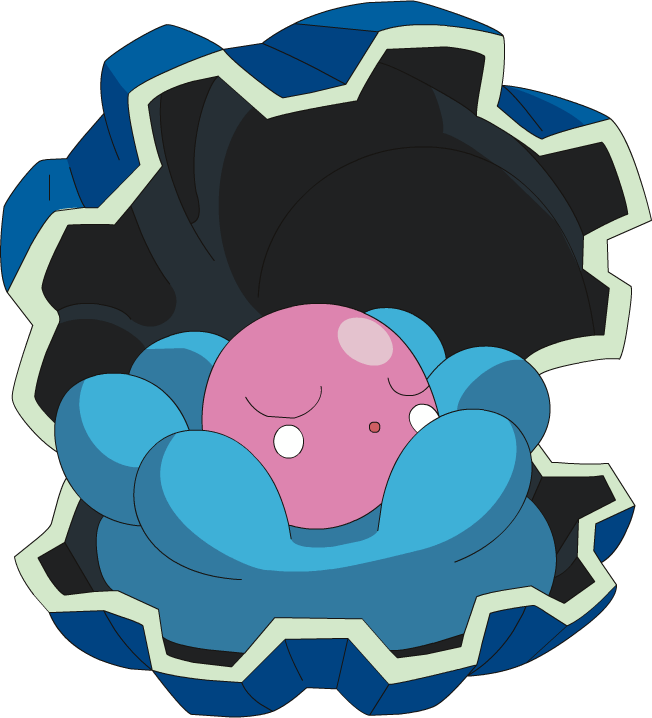 Pokemon Clamperl is a fictional character of humans. 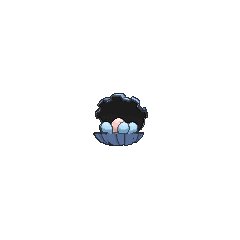 Clamperl (Japanese: パールル Pearlulu) is a Water-type Pokémon introduced in Generation III. It evolves into Huntail when traded holding a Deep Sea Tooth or into Gorebyss when traded holding a Deep Sea Scale. Clamperl is an aquatic Pokémon that makes its home on the seafloor. Its bivalve shell is dark blue with a silver rim along the inner edges. The shell is used to clamp down on prey, as well as for protection. A fully-grown shell will have nicks and scratches all over. Inside of the shell is a fragile, light blue body composed of six spherical extensions with a pink, pearl-like head in the center. There is a circular white patch on each cheek. The pearls produced by this Pokémon amplify psychic power, and may be blue as seen in the anime. When it is close to evolution, Clamperl will become too big to fit inside its shell. Clamperl made its debut in Clamperl of Wisdom. Spoink lost its pearl and took a blue pearl that was created by a Clamperl from Isaiah's lab. Team Rocket also wanted to get their hands on the blue pearl. Clamperl were also featured in The Evolutionary War!. Trainers that lived on the A-B-C Islands had a rivalry over which Clamperl evolution was stronger. A Clamperl appeared in the opening of Lucario and the Mystery of Mew. A Coordinator's Clamperl appeared in New Plot, Odd Lot! participating in the Performance Stage of the Mulberry Contest. Multiple Clamperl appeared in Going for the Gold!. AG093 Clamperl May's Pokédex Clamperl, the Bivalve Pokémon. Clamperl holds a powerful shell that's useful in not only protecting itself, but also in clamping down on prey. A wild Clamperl appeared in the waters that surrounded the Mossdeep Space Center in The Cavern. Clamperl made a minor appearance as a member of Wallace's party during his ascent to Champion. Little is known about it, not even its gender or nickname. Clamperl's sturdy shell is not only good for protection - it is also used for clamping and catching prey. A fully grown Clamperl's shell will be scored with nicks and scratches all over. Clamperl grows while being protected by its rock-hard shell. 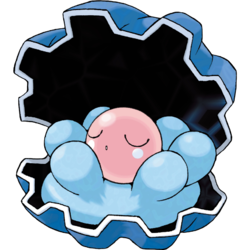 When its body becomes too large to fit inside the shell, it is sure evidence that this Pokémon is getting close to evolution. A Clamperl slams its shell closed on prey to prevent escape. The pearl it creates upon evolution is said to be infused with a mysterious energy. It is protected by a sturdy shell. Once in a lifetime, it makes a magnificent pearl. It makes a single pearl during its lifetime. The pearl is said to amplify psychic power. When it evolves, it makes a mysterious pearl that amplifies psychic powers when it's held. Clamperl’s sturdy shell is not only good for protection—it is also used for clamping and catching prey. A fully grown Clamperl’s shell will be scored with nicks and scratches all over. Moves marked with a superscript game abbreviation can only be bred onto Clamperl in that game. 51%-100% HP In my lifetime, I can make one pearl, and that's it! 26%-50% HP My health has dipped to approximately halfway down. Level up All right! I gained a level! My pearl is growing bigger! 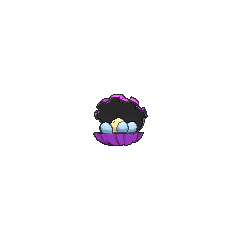 For other sprites and images, please see Clamperl images on the Bulbagarden Archives. Clamperl shares its category with Shellder and Cloyster. They are all known as the Bivalve Pokémon. Clamperl is the only Pokémon that evolves by trade holding one of two different items. Clamperl loses the most weight of any evolving Pokémon when it evolves to Gorebyss, losing 65.9 lbs. (29.9 kg). Clamperl is possibly based on an oyster or a giant clam. Clamperl's appearance and its evolutions suggest that it could also be based on roe. Clamperl is a combination of clamp or clam and pearl. Pearlulu is a combination of pearl and lulu (slang for someone or something that is exceptional or remarkable). It may also involve لؤلؤ lulu (Arabic for pearl). Japanese パールル Pearlulu From pearl and lulu (slang for someone or something that is exceptional or remarkable). It may also involve لؤلؤ lulu (Arabic for pearl). Mandarin Chinese 珍珠貝 Zhēn Zhū Bèi Literally "Pearl shellfish"